The Moon in grounded, solid Capricorn inhabits the sweet spot between Jupiter in Scorpio and Neptune in Pisces for a little while today. Perhaps this helps with processing all the big emotions we’ve been feeling lately. Today is a new day. Without judgment, can you find a way to recommit to the vital work you were put here to do? We need you. Mercury enters Leo helping us to focus on what our particular gifts are. Having a bit of fun with this energy is not a betrayal. Do you. Pluto tells us what we need to purge, transform, and regenerate. Pluto has been in Capricorn since 2008 directing us to purge, transform, and regenerate foundational systems, our understanding of heritage, our obligations, and our measures of success. That’s a lot of change. Today the Moon in Capricorn contacts Pluto, as it does every month. We have the opportunity to notice the changes we have made and envision the ones still to come. Where Pluto treads, great power is released. I have been drawing upon the strength and power of my ancestors of blood and spirit, those who support this kind of transformation. Where does your power come from? I think we are well past the era of questioning authority, don’t you agree? Questioning authority seems too tame for the current state of affairs. It’s time to be more subversive. With the Moon in radical Aquarius (conjoining Mars) and Mercury in Leo making a square to Uranus in Taurus, it is time to invent new subversions. These are activist, trickster energies. Mercury in Leo inspires creative and fun ways to subvert oppressors. The challenge of this transit may be a disassociation between individual experience and collective experience. Avoid ego traps while trying to change the world. Invite in. Collaborate. Innovate. The puzzling quincunx aspect between the Sun in Cancer and Mars in Aquarius asks us to pause and feel, and to not be put off by those feelings. If that means you start your revolution tomorrow, then so be it. We want a world of open hearts. Planetary influence is a rich stew, at best. At any given time, several storylines are being played out. Some rise to the surface and swirl with another and then sink back down for another influence to pop to the surface. There you have it, Teri’s stew theory of cosmological influence. One storyline has been the #metoo movement. People have shown incredible courage in exposing abusers and telling their stories. We are reminded today that this work continues. Another storyline is about radical action and confronting power. These stories are converging today through a square between the Moon in Aquarius and Jupiter in Scorpio mixed with a quincunx between Venus in Leo and Pluto in Capricorn. Venus in Leo isn’t about being nice. We probably aren’t in the mood to be nice, but we can be different, brilliant, and dynamic in the ways we expose and confront. This lunar cycle was seeded with a Gemini New Moon and culminated in a Capricorn Full Moon. That’s a range of experience spanning from the smallest dandelion seed drifting upon the breeze to an enormous mountain that must be climbed. We’ve been stretched. And still feel that way. 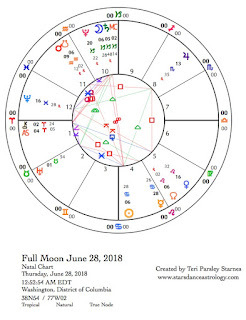 What have you learned since the New Moon of June 13? I began my lunar cycle with the intention to seek peace of mind. At the First Quarter phase that intention shifted to cultivating an open mind. I began this lunar cycle with the idea that our minds create our realities. Now, I am much more aware how influential my emotions are. At this phase, I feel successful when I can accept whatever mental/emotional state is present. Sometimes these states need a response, like when I am anxious, so I don’t get stuck. Sometimes, I can simply pause long enough to ask these mental/emotional states what they need from me and know they will be moving on soon. Mind/emotion is like that. The Capricorn mountain is another thing. I’ve learned it might feel like mind/emotion creates reality, but reality is really reality. That mountain represents reality. The reality of finite resources, energy, time. The reality of oppressions. The reality of the things and people I cherish. The reality of the work that must be done to bring us into better relationships. Reality is worth spending some time with. I say that well aware that the Moon is in Pisces and emotion will color everything that I think is reality today. We are flowing from one reality to another. The Piscean quest is to find all realities are one. A quincunx aspect between Mercury in Leo and Saturn in Capricorn tests our responses to reality too. We are working hard at self-expression. What reality is getting in your way? This teacher asks you to hone your gifts so they can shine. Empathy is not a weakness. Lately, it feels like empathy is teaching us strength. The world can be cruel but we don’t have to be. Brene´ Brown says, “If we can share our story with someone who responds with empathy and understanding, shame can't survive.” Empathy heals. With the Moon in Pisces making a grand water trine with the Sun in Cancer, Jupiter in Scorpio, and Neptune in Pisces, we can feel deeply the healing power of empathy. Perhaps we receive healing. Perhaps we pass it along. Allow the feelings—the grief, the joy, the love, even the anger that stems from injustice—to flow. Stand in someone else’s shoes. Receive. Chiron in the independent sign of Aries stations retrograde on U.S. Independence Day. Chiron makes us sensitive to our wounds, to the places that never completely heal. Perhaps we feel the national wound of isolation today. Perhaps we are reminded that we need to belong, to be in relation and obligation to others. The Moon is in Pisces for most of the day in U.S. time zones. This may not be the best influence for parties. The introverts tend to get more introverted, and watch out for those who are over-intoxicated. Water is not always passive or peaceful. Perhaps we notice that today. The Sun in water sign, Cancer, makes an exact trine to Jupiter in Scorpio (another water sign). This sets off a wider-orb trine to Neptune in Pisces from both. Sometimes water flows right into action and that may be what the Sun most wants to do today. The impetus is to protect the vulnerable and expose those who are doing harm. The Aries Moon readies us for action too. Mercury in Leo opposes Mars in Aquarius. We can’t keep quiet about anything and probably have little to no patience for ideologies we don’t agree with. Avoid getting into needless battles. Instead, use your passion to create. This will yield much better results in the long run. Full Moons are about illumination. During this phase, the opportunity arises to perceive with new light, a soul light, our deeper truths. What is revealed is not always easy. We are not always ready. Our souls are not always ripe. But each lunar cycle provides this unique moment to see where we are this time. Revelations can be about ourselves as individuals and can be about ourselves collectively. Readiness and ripeness become even more complex as we think about what we need to see collectively and what role each of us may play in midwifing our collective revelations. This moment in U.S. history demands illumination. We desperately need clarity and a dismantling of American myth. We need a new and truer moral compass. We need to know our history and choose our future. And we need to be ready to act upon what we are being shown. The Full Moon in Capricorn is an opportunity to tap into the Cardinal Earth capacity to know our past, to act with integrity, and to work hard to manifest a better future. Realistic Capricorn is a sign prepared to see one’s image head-on. That doesn’t mean it isn’t painful, as Baldwin suggested. It is, but Capricorn is also a sign that will do what is necessary to move forward and thrive. I most want Capricorn, of all the signs, to be on my side when I need to make hard choices. Baldwin suggested, and I believe he was right, that if we try to maintain our American myths, we will perish. This isn’t an easy Full Moon, but it can be a powerful moment of illumination. Family and security are key concepts for this Full Moon. Capricorn is one of the parental signs. Cancer—where the Sun is right now—is the other. Both want the family to thrive. They each have a different strategy. Cancer makes the nest and supports through unconditional love. Capricorn sets the goals and supports through accountability. Nurturer and challenger meet at this Full Moon to bring illumination. We are wide open as we empathize with the stolen immigrant children who need to be comforted but are not allowed to be. Empathy means we feel what they feel, and these feelings are reminding some of us about the ways we haven’t been nurtured. Many of us are feeling raw. The activation from the Capricorn side involves anger and determination, which are strong right now. Capricorn fury, heightened by a stationary Mars in Aquarius, and steadfast Capricorn integrity will climb mountains as well as move them to stand by the value of family. Saturn in Capricorn conjoins the Moon adding incredible determination to act on behalf of the vulnerable. Capricorn anchors traditional values but currently we are transforming toxic traditions. Since Pluto entered Capricorn in 2008, we’ve been challenged to compost dead values and reinvigorate living values that encourage our thriving on the Earth. This moment in U.S. history is not calling us to return to nuclear family structures that keep us from relating and connecting to each other. This dramatic moment in U.S. history and this ordinary Full Moon in Capricorn represent another chance to collapse American myths around family and protection. 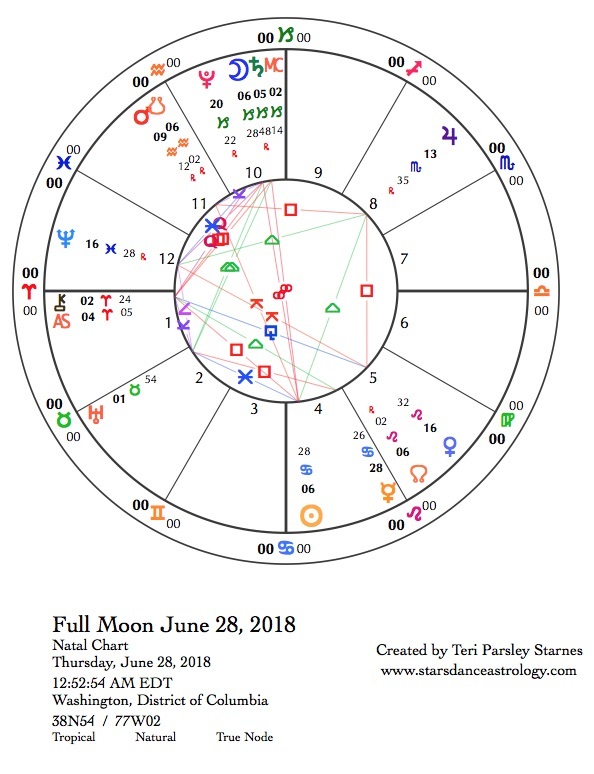 Emotionally, we are stressed at this Full Moon. The Moon conjoining Saturn brings heaviness and possible depression. Very real trauma is being triggered. A square to Chiron in Aries from the Sun and the Moon activates helplessness and a strong desire to be of help anyway. Jupiter in Scorpio is on the verge of stationing direct (July 10), increasing the frustration of wanting to move on but not being able to yet. Venus in Leo is square to Jupiter. This Venus is ready to act dramatically to avenge abuses that are coming to light. More frustration is possible as Mars moves retrograde in Aquarius until the end of August. A contradictory aspect between Venus and Neptune in Pisces tempts some to want to revive American myths of heroic actions saving the day. It is painful to meet our myths head-on. We aren’t blameless or powerless. Fortunately, Capricorn doesn’t have a lot of time for remorse. There is work to do. I treasure the practice of following intention through a lunar cycle. I don’t always achieve the goal of the intention, but I do learn a bit more about myself each time. One of my teachers, Cynthea Jones, described ritual as “a multi-sensorial prayer that lays down new patterns in the soul.” Magical intention works the same way for me. Regardless of whether I completely manifest my desire I know I am laying down new patterns in my soul every time I follow my intention from new to balsamic phase. I knew this month when I chose an intention of peace of mind that at times I’d fall far from the mark. Peace of mind is elusive at best. I’m trying to believe it isn’t impossible. The peace of mind I am interested in is not absent from the struggles in and around me. I don’t want peace in my mind so I can feel safe or complacent. I chose the words peace of mind as a way to describe an open, engaged, questioning, and facile consciousness that is freer from mental entrapments like projection, obsession, and entrancement. I know my mind will do these things, I’d just like to spend less time in those mental spaces. So, “peace” of mind might not be the right way to frame my intention. Perhaps openness of mind is better. Dandelion seeds are my inspiration for this intention, which itself was seeded by the pollinator air sign Gemini. This is the season to let thoughts fly where they will, like seeds sent on the breeze. This reminds me of non-attachment. I don’t need to grasp or hold my thoughts. They come and go. They are part of the wild nature of thinking where sometimes my thoughts land on brilliant possibilities that can seed the future and sometimes they don’t. How do I extricate my thoughts from these dead places? First of all, I suppose I need to recognize when I’ve landed in a dead place. For me, those dead places feel leaden, repetitive, certain rather than curious, blank, and bitter. Yuck. Just writing those words brought me down. Places of possibility are different. They feel light, receptive, interdependent, curious, and responsive. Yummy. Just writing those words helps me rise. The second week of any lunar cycle brings challenges. We might want to give up our intentions; we will meet obstacles. All choices are fine, but we have the opportunity to notice what happened and why we responded the way we did. A new pattern will be laid in our souls. This new pattern moves us along in our journeys to ourselves. The week of June 20 -26 could be intense. Several t-square aspect patterns (a complex relationship between planets that can spark crisis, reactivity, and events that bring challenge and change) throw obstacles our way. One pattern involves stationary Mars in Aquarius, Venus in Leo, and Jupiter in Scorpio. Mars is taking a stand in Aquarius as this planet prepares to turn retrograde on June 26. Since Mars governs movement as well as anger, we could feel stuck. These are all fixed signs; we could be really stuck. As the fixed air sign, Aquarius represents stuck mental states. An inability to move our thoughts could feel like fixated ideologies obstructing an open mind. An open mind is not the same thing as an indecisive mind. I still need to stand for my values while I practice being lighter, more receptive, interdependent, curious, and responsive, but it could be challenging to do so. Venus in Leo opposes Mars. We are tempted to take things personally, and it may be true. Conflict could be about us and impact us deeply. Venus, here, is the champion of our nobility. Patience for abuse is low. Our relationships need to be imbued with respect. Jupiter in Scorpio has been uncovering reprehensible behavior, things we can no longer tolerate. It may be time to say goodbye to anything that doesn’t support our thriving. Cardinal signs make up the other t-squares this week. Cardinal influence could spark a crisis in decision-making and action. When the Sun moves into Cancer on June 21, Saturn in Capricorn and Chiron in Aries create a crisis in leadership. Some will rise to the occasion. Others will not. Under these influences it seems we need leaders who are compassionate and no-nonsense, decisive and open, non-dogmatic but ethical. Perhaps these leaders are us. We may be the ones we are waiting for. June 20—First Quarter Moon: Sprouting. Peace of mind—the absence of worry, the innocence of always believing the best, the calm of being safe and secure—is a luxury that is out of reach. More and more, I am waking up to the reality that this kind of peace of mind is an illusion. This is disturbing. The world is disturbing. Still my body reaches for a breath, a sigh, a long exhale, to find calm. Breathing, I can open both mind and heart to take in more of that which disturbs, to wake more to ways I can be the change. This phase of the Moon is where we meet challenges to our intentions head on. I am reframing my intention from peace of mind to open mind, a mind of lighter curiosity and flexibility. This in no way changes how disturbing things are right now. Perhaps it changes how I can respond to those things, even if it is only to remember what my body knows: to take a breath, a sigh, a long exhale. The Moon in cardinal air sign Libra seeks equanimity—the balance that breath can bring. This Moon, however, is part of a complex pattern with Saturn in Capricorn and Chiron in Aries that feels heavy and can hinder equanimity. Chiron awakens empathy through memories of our own pain, especially the pain of being powerless to change anything. Saturn places the burden on us to act anyway. Saturn reminds us to connect with our ancestors, those who hold us to a better standard and are supporting us as we strive to redefine who we are. Mercury in Cancer makes a supportive trine aspect to Neptune in Pisces. Empathy is strong. This transit represents the powerful water influence that has flowed through this airy season. Information goes straight to our hearts to be processed there. Emotional responses can be surprisingly intense. Something tells us to listen anyway. Thursday, June 21. Summer Solstice. Sun enters Cancer. The first day of summer 2018 may not remind us much of the song, Summertime. We are more aware that for many the living is not easy right now. Summer in the northern hemisphere is defined by the Sun’s ingress into Cancer. This cardinal water sign is about home and family, two issues that are breaking our hearts right now with children being taken from their parents at the southern U.S. border. A new season marks a new focus and a new way to focus. Cardinal signs are not the only signs of leadership, but these signs ask us to see the role of leadership in a new way. The Sun in Cancer, Saturn in Capricorn, and Chiron in Aries (all cardinal signs) are in a challenging aspect pattern. On one hand, we may feel helpless to make a difference, but this helplessness can open a door to empathy for others who feel the same. That empathy creates a desire to protect the vulnerable and hold perpetrators accountable. Within this influence for accountable and responsible leadership, the exact opposition between Venus in Leo and stationary Mars in Aquarius is intense. Not only is Mars stationary but both Mars and Venus are conjoining the Moon’s nodes. Venus and the north node say move towards your own nobility. Be daring, be creative, be true to your heart’s command. We are composting worn out versions of Aquarius: dogmatism, frenetic obstruction, and detachment from empathy. As Mars turns retrograde, we take a journey of reclamation. May we reclaim the boldness of going against the tide, the vision to dream a new world, and the inclusion of all in our interconnected webs. The Moon in Libra makes its own waves through squares to Mercury in Cancer and Pluto in Capricorn. “Injustice anywhere is a threat to justice everywhere,” according to Dr. Martin Luther King Jr. Mercury and Pluto ensure we do not forget that injustice is a threat to safety and our common humanity. It is past time to speak our truths on behalf of justice. Among the most impactful transits of today are a stimulating sextile between the Sun in Cancer and Uranus in Taurus and a challenging opposition between the Moon in Scorpio and Uranus. We are reminded that the Earth is speaking to us. Uranus’ ingress into Taurus changes the way we think of change. Taurus wants stability, but we can’t ignore all the changes that must happen first before we can really stabilize. The aspect between the Sun and Uranus encourages ways we can awaken. The Moon’s dive into Scorpio stirs up fears and anger that may push us closer to action. I believe following intention through a lunar cycle lays down new patterns in the soul. I also have observed that our souls follow the pattern of seed-growth-blossom-fruit-seed-compost through longing and desire even when we don’t consciously choose an intention. So, consciously or not, we arrive at the stage of budding. Illumination and release are building, but we aren’t there yet. My lunar intention is cultivating open mind. My soul had some plans for me because I chose this intention based on the New Moon in Gemini, a light and airy sign, not because the transits this month will challenge me to the core to develop mindful openness. But that is the way it is. Current transits are intensely challenging to the intention of open mind. Your conscious or unconscious intention may feel the same. What do our hearts tell us needs to happen next? Our souls respond to the Scorpio Moon to go to a deeper level to root out cause/trauma/desire/transformation. This water sign reveals our wounds but also provides the medicine of water’s transformation. Release what you are holding in pain. Let it go. The impulse to claim power comes from the exact opposition of Mercury in Cancer and Pluto in Capricorn. We find our voices to stand for those who are vulnerable. We confront toxic power. Our power comes from empathy and morality. The Sun in Cancer makes a square to the wounded healer, Chiron in Aries. Where are the warriors who will fight for the vulnerable? How have we been wounded in the part of us that will defend the defenseless? What step do you need to take next to release the pain and move toward your best outcome in this lunar cycle? Be gentle, as always, with yourself. This appears to be a day made for licking our wounds and putting ourselves back together. The Moon in Scorpio for most of the day (U.S. time zones) means we aren’t especially gregarious, but transits are more gentle today. Exhale. Love yourself up. Reach out to others. Sagittarius (where the Moon is today) has a reputation for being more focused on hitting the trail than sticking around through the hard stuff. I often think this is a natural response to intensity that Scorpio stirs up right before. The wind hitting our faces as we ride out of town can help us get back to ourselves. Yes, we are indeed alive. You might feel that way today. A square between Venus in Leo and Jupiter in Scorpio might present a challenge between the impulse to embrace living and the impulse to purge pain. These impulses are not mutually exclusive, they just might feel that way today. Don’t abandon yourself and don’t feel guilty if you take a day away from the dark stuff. Mars in Aquarius stations retrograde today. They (gender-neutral pronouns for planets) remain retrograde till August 27 and don’t leave the retrograde zone (9 degrees Aquarius) until October 8. During this period of time, our wills/warriors/desire natures are retracing steps to heal, reclaim, and gather power from the domain of Aquarius and Capricorn. As an air sign, Aquarius might be showing us the state of our minds and the way we need to cultivate state of mind to move more freely and powerfully into our lives. Aquarius is a visionary sign. Mars may be going back to retrieve a vision that you’ve lost sight of. Mars may be going back to reframe what the vision is for you now. We care about the collective in both of these signs—Aquarius through vision and Capricorn through stewardship. Do you feel yourself to be dedicated to your communities? Where do you find sustenance for this dedication? I like to think Mars is going to retrieve the medicine we need to keep our collective actions going into the transformations that need to happen in this world. We don’t have to lose idealism just because Mars is retreating. Retreats can bring new sources of energy.